1889. Friday, April 22. The cannons had fired, igniting the first chaotic land run, and several counties in central Oklahoma—at that time, Indian Territory—were settled within in hours, stragglers still coming in throughout the night and the day after. The race had been won. Schooners dotted the virgin lands, townships, and counties, and pioneers had already begun to set up their homes. Many women, with their children, had joined their husbands in the land run. 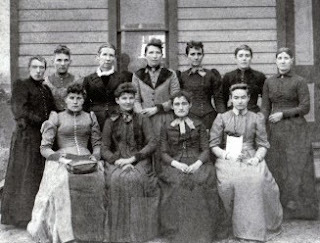 A distinctive group of women in the Edmond township established the Ladies Aid Society and started almost immediately to gather resources for building a schoolhouse for the children. Acquiring lumber on credit from The James Brown’s Lumber Co. in May of 1889, labor would be voluntary. To ensure the school would be free for all the children, the women of the Ladies Aid Society began a worthwhile endeavor—fundraising. The first activity was an ice cream social where blackberries, ice cream, cake and lemonade were sold. They made a whole whoppin’ twenty-five dollars from that! That’s not very much in our day and age, but considering back then, you could get a kid sick on one penny’s worth of candy, it was a lot of money! 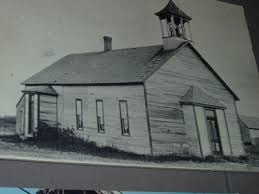 By August, the schoolhouse was in operation and doubled as the church and community center. Rev. Thomas N. Horner preached the first sermon on the 4th of August, then performed the first wedding recorded in Indian Territory on the 11th of the same month. On September 16, 1889, with Miss Ollie McCormick presiding as teacher, the first day of Edmond Public School began. The first day she had nineteen students. By the end of the week she had thirty-seven. The floor was dirt, the seating handmade, children walked, ran, skipped, rode horses and donkeys to school. There are stories that a few students actually rode goats! The schoolhouse had a little lean-to so the animals that were ridden had shelter. The First through Eighth grades were taught there. The second fundraising endeavor on November 28, 1889, was the town’s first Community Thanksgiving Dinner followed by a ball held at the schoolhouse. It was agreed that the men would go hunt, and the women would cook. It was reported that the dinner included one hundred thirty-two quail, eleven prairie chickens, twenty-two rabbits, seven turkeys, two squirrels, two raccoons and . . . one opossum. What a feast! But their work was not in vain. They managed to raise enough money that the Ladies Aid Society was able to pay off the debt for the lumber, and pay Miss McCormick’s first year salary which was thirty dollars a month for eight months. Four different churches were established in the schoolhouse. On November 9th and 10th, 1889, the Methodist Episcopal Church was officially organized in the schoolhouse. January 19, 1890, the Christian Church was organized in the schoolhouse and held services there the longest. On Easter Sunday, April 1st, 1890, the First Presbyterian Church of Edmond was organized. On May 11th, 1890, the First Baptist Church was the last church established. Not only did the schoolhouse see the first wedding in Indian Territory, it saw the first funeral on June 21st, 1890, where family, friends and parishioners gathered to say good-bye to the Reverend Rush McDonald. Enough settlers had come in that, within ten years, the Edmond Public School had outgrown its building. On August 21st, 1899, Hardy C. “Pete” Anglea purchased the old schoolhouse and schoolyard lots for a residence before the new schoolhouse was completed. He put in a staircase so he could use the empty attic space above, moved the house to a sit on a new foundation fifty feet west of the original location in 1903, added windows on each side of the front door, and a new Victorian-era front porch. On January 2nd, 1900, the Edmond Public School was moved to its new home, a two-story stone building. In 1908, Anglea sold his schoolhouse residence to the McGowan family, who sold it to the Pledger family in 1919. In 1927, the Sanders family bought it. In 1950, the Sanders’ son, Woody, converted the downstairs front of the house to his camera shop while the back and upstairs continued to be their residence. Sanders Camera Shop closed in 1975 due to too much traffic forcing the city to widen Second Street to four lanes, taking away the shop’s parking. The building lay dormant for twenty-five years. That’s my earliest memories of the building—odd green peeling paint on the building, boarded windows, cracking siding and sign. In 1998, the Edmond Historic Preservation Trust started raising funds to buy and restore the schoolhouse. There was a huge debate on whether or not the Sanders Camera Shop really was the original schoolhouse of the pioneer town Edmond, Indian Territory. But the truth came out when the Trust bought it and read the deed. “School Lands”. The Trust had found their schoolhouse! Over the years it has been restored, refurbished, repaired and lovingly attended. Now it is open to local school kids to come experience what school would have been like back in 1889, bringing period-specific food (no bananas) for lunch, dressing up like Little House on the Prairie, and spending the day with the schoolhouse’s own schoolmarm. It counts not as a field trip but as an actual day of school because of the curriculum and the certified teacher. For the general public, it is open, free of charge, the first and second Saturday of every month from 1-4pm. They have a weekend schoolmarm who is a life-long Edmondnite and very proud of her Edmond heritage. Over 126 years ago, Edmond became history with the first schoolhouse in Indian Territory, the first wedding, and the first funeral. About 125 years later, it’s made history again! Even though I'm from Texas, Oklahoma history has always fascinated me. It's why I wrote my first series set in Oklahoma. Thanks for the info about the schoolhouse. Next time we're in Norman or Tulsa, I'll have to make a side trip and see the schoolhouse. Thank you so much, Martha! Definitely make sure to come up. If there's any way you can let me know when you will be up, I'll make sure if the weekend schoolmarm isn't going to be able to be there, someone will. I really need to go visit the schoolhouse. It's cool what a group of determined women can accomplish. We're glad to have you join us, Alanna. Thank you, Vickie! It really is humbling to think what they did, just in daily life. I am very honored to join you. ...did I mention psyched? Thanks for sharing this fascinating history! Thanks, Betti. Might want to stay tuned. I've got two more installments on the schoolhouse coming up. Second one will be next month and third will conclude in October, a very special blog! I love this so much! Probably the most interesting biography on OK History that I've read, and it's especially sweet because you not only wrote the piece, but that you actually took me to the schoolhouse! Ah, sweet memories! Keep up the great work! I love it & will most definitely be back for another read! KELLIE!!!! Yaaaay! Thank you so much! I still have that picture of you and your siblings in it when you visited. Yes, such sweet memories! I miss our weekly, sometimes daily reading of the continuing saga of whatever story we were working on and your "Pause" and "Play" that you do. We still use that. Keep in touch girl. Miss you guys! Such a wonderful telling of that amazing time and history. You did a great job. I wait expectantly for your future blogs. Well done! I did not know any of that and it was very interesting. Sometimes timelines can be tedious. And boring but you made it flow and come to life in the telling. Thank you, Janet! That means a lot to me. I agree. A lot of history is boring. I was one of those students in school who was not a fan of history. Until I met a reenacter who brought history to life. And I got the bug. Living history. Come back next month. I'm continuing the schoolhouse. I love old schoolhouse stories, thank you for sharing! Thank you so much, Bet. I do too! If all of the schoolhouses have stories of how they were built like this one, the people really did care for the education of their children. Oh, the stories the walls could tell! Gets my imagination going! My novel, The Calling of Ella McFarland, centers on a young woman's fight to better the lives of women--including the provision of equal education--in OK's 1907 state constitution. Ella would love this blog! Thanks. I would be interested in reading that, Linda! Thank you!